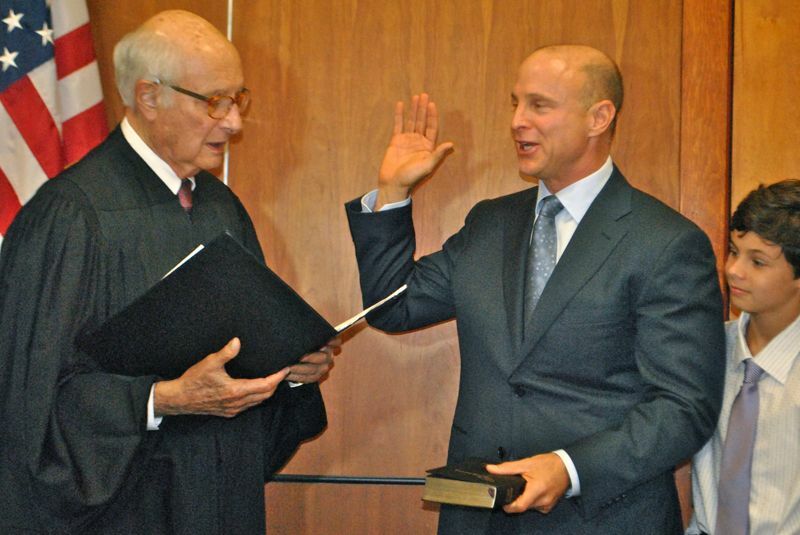 Senior Circuit Court Judge William E. Gladstone administers the oath of office to Delray Beach Mayor Cary Glickstein Thursday evening, as Glickstein's looks on. 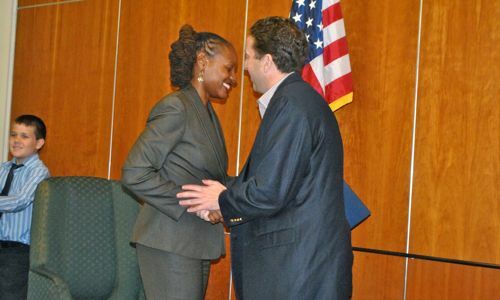 Commissioner Adam Frankel and City Clerk Chevelle Nubin. 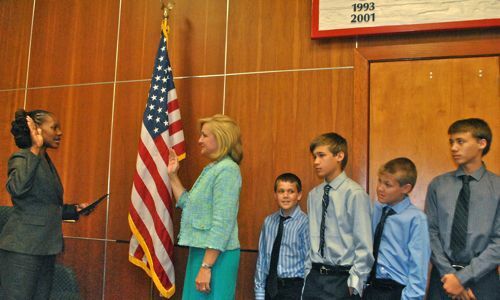 New Commissioner Shelly Petrolia takes the oath while her four sons look on. The new commission goes to work. Outgoing Mayor Tom Carney receives applause as he leaves the dais. 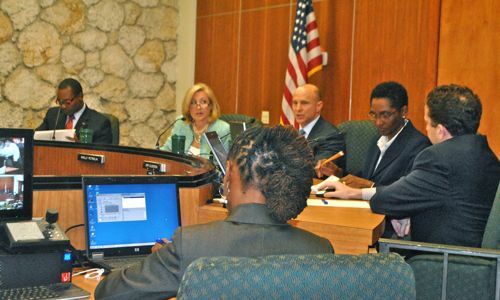 DELRAY BEACH — The campaigns are over and now the real work starts for the 2013-14 edition of the Delray Beach City Commission. Cary Glickstein took the oath of office as the city’s new mayor while newcomer Shelly Petrolia and incumbent Adam Frankel were sworn in as members of the commission Thursday evening during the city's annual organizational meeting. William E. Gladstone, a senior circuit court judge from Miami-Dade County and a longtime friend of Hugh Glickstein, Cary Glickstein’s father, administered the oath using Hugh Glickstein’s bible. Outgoing Mayor Tom Carney, who lost to Glickstein during the municipal election held earlier this month, thanked the city staff and members of the commission for their help and support during his time in office. Carney won election to the commission two years ago, and became mayor in early January when then-Mayor Woodie McDuffie resigned. 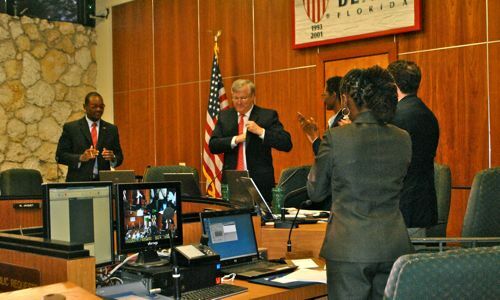 “It’s been a pleasure and a privilege to serve on the commission and as mayor the last two years,” Carney said. Carney also gave his best wishes to Glickstein and Petrolia. Commissioner Al Jacquet was selected to serve as the vice mayor, while Shelly Petrolia was elected as the deputy vice mayor. The first bit of controversy also flared up as commissioners took up a couple of procedural matters that in the past would have generated no notice let alone any dissent. The first matter was scheduling the commission’s annual goal-setting meeting, which has been done a year in advance when the new commission takes office. Commissioners by a 4-1 vote deferred the matter. 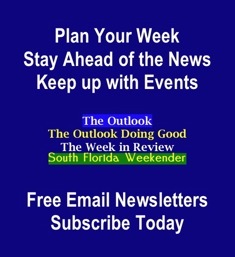 The other was approval of the commission’s local rules and how meetings are conducted. Voters during the March election approved a charter change that allows commissioners to decide how votes are taken during their meetings. The idea behind the change was to give commissioners freedom to eliminate the need for least some role call votes. Commissioners approved the rules as is by a 4-1 vote, meaning the role call votes will continue.